Do you love trivia? 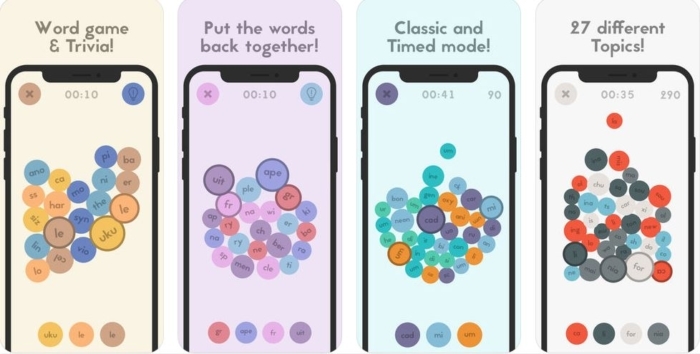 Do you love word games even more? Subwords is an exciting mix between the two! Words are split into fragments, and you have to put them back together as fast as possible. The words are bound to a certain topic, so you have to know about the topic in order to solve the puzzle. Uh oh! What happens if you aren’t familiar with the topic? That’s OK! Just click the bulb, and you’ll learn something new. And now this already exciting game has a great new update focused on accessibility! The iPhone and iPad app now has VoiceOver support, helping with auditory descriptions of onscreen elements and providing helpful hints along the way. Several colors have been tweaked to make the text easier to read for everyone. There’s even a high-contrast mode. Animations are now reduced if Reduced Motion is turned on in your iOS settings. Education: Train word spelling; learn new vocabulary; and even train languages! Subwords helps you learn new concepts to improve your spelling skills and maybe even learn German!